From the Back Cover: Newly settled in Hallensham, England, petite American beauty Goldie Mae stands to lose the first real home she has ever known-thanks to her disreputable uncle's drunken boast of friendship with the long-departed Duke of Ravenhurst. Now, unless the Duke himself-or a convincing imposter-supports the old man's lies, the angry townsfolk will drive Goldie and her kinsman from their village. With luck-and Goldie's infallible "duke lessons"-the secretive stranger she encounters while bathing might fool the doubting locals. 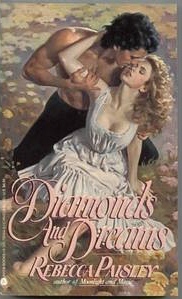 But little does the feisty, determined miss realize that handsome Saber West is, in fact, the very lord she wants him to impersonate-or that his gentle virility will awaken in her a passion beyond measure, embroil her in a danger beyond imagining…and fulfill the rapturous promise of a love beyond dreams!